ww2dbaseDu Yuming was born in Shaanxi Province, China, the fifth child (of seven) and oldest son of teacher Du Liangkui and mother Gao Lanting. He attended Chengjiacha Elementary School and Yulin Middle School in his home town. 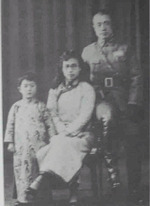 In Aug 1923, he married Cao Xiuqing, daughter of a businessman from his home town. Upon graduation from Yulin in 1923, he traveled to Beijing, China, intending to study for university examinations, but instead, persuaded by new friends, enrolled in the newly established Whampoa Military Academy in Guangzhou, Guangdong Province, China in Apr 1924. Having learned and enjoyed shooting hunting rifles in middle school, he had taken a liking to the milirary profession, and joining the Chinese Army seemed to be a natural step to him when it was brought up by his friends. Whampoa courses began in Jun 1924, and he graduated in Dec of the same year with the first class. He joined the Nationalist Party while being a student at Whampoa in 1924. In Jul 1926, he served as a platoon leader in Wuhan. In 1927, he was briefly imprisoned during a political purge. In the summer of 1928, he was named a commanding officer of a training unit. In early 1929, he served as an instructor at the Republic of China Military Academy in Nanjing, China. In the winter of 1929, he became the chief of staff of the 2nd Brigade of the 1st Division. In 1930, he served as a battalion commander, and later regiment commander, in the training 2nd Division. In the winter of 1930, the training 2nd Division was conducted into the Chinese Army as the 4th Division, and Du was made the commanding officer of the 24th Regiment of the 12th Brigade in the 4th Division. In early 1932, he participated in actions against communist forces and was recognized for his leadership abilities, and later in the year he was given command of the 73rd Brigade of the 25th Division; before long, he would be made the deputy commander of the 25th Division under General Guan Linzheng. 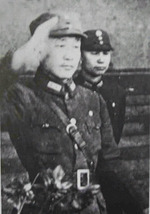 In early 1933, he participated in the First Battle of Hebei, during which he stepped up as the acting divisional commander when Guan was wounded in action. Between the fall of 1933 and the spring of 1936, he studied advanced courses at the Republic of China Military Academy in Nanjing. Upon completion of the advanced courses, he was supposed to return to the 25th Division, but disagreements between Du and Guan during the First Battle of Hebei made him reluctant to do so, leading to his request for transfer; he was then assigned to the Republic of China Military Academy as an instructor to study and teach mobile warfare. ww2dbaseIn 1937, the year China and Japan engaged in the war, Du was named the commanding officer of the first Chinese armored regiment at the rank of brigadier general. He played a minor role in the Second Battle of Shanghai as two of his armored companies participated in the defense of Huishan docks. In 1938, after being withdrawn to Hunan Province, China, his regiment was expanded to the 200th Division, and he remained its commanding officer. During 1938, he focused on the training of the officers in his division, developing armored car-infantry tactics. In Dec 1938, the 200th Division was exapnded to form the 11th Corps, and Du remained with the unit as its deputy commanding officer with his new headquarters at Quanzhou, Guangxi Province, China. In 1939, the 11th Corps was reformed as the 5th Corps, and he was promoted to be its commanding officer; in this role, he was known for placing much attention on training, holding rifle shooting competitions among infantrymen and giving prize money to winners. In Dec 1939, his 5th Division surrounded and wiped out an entire Japanese brigade at Kunlunguan Pass in Guangxi Province, China, earning him widespread fame. In 1940, he took on additional duties in organizing defenses of Kunming, Yunnan Province, China. In Feb 1941, he was dispatched to Burma, India, and Malaya to inspect Allied defenses in Southeast Asia. In Mar 1942, he participated in the Anglo-Chinese campaign against Japanese advances in Burma; although he achieved several tactical victories with the 5th Corps, ultimately the campaign was a failure, and while he fell back northward toward China, he suffered extremely high casualties. Upon returning to China, he claimed responsibilities for the defeat, requesting Chiang to remove him from command for the failure; instead of punishing him, however, Chiang, who thought Du had conducted an outstanding campaign considering the circiumstances, promoted him to lead the 5th Army and gave him the responsibility of all defensive units of Kunming. The British, however, criticized him for the heavy loss of lives during the retreat. He would remain in Kunming for the remainder of the war. ww2dbaseIn Apr 1945, Du was secretly summoned to Chongqing, China by Chiang, who ordered him to prepare for a campaign against General Long Yun, who had grown far too independent from the central government to Chiang's liking, after the Japanese defeat. Upon the success of the brief campaign against Long, Du dutifully took the blame for this purge, and was awarded an important position in northeastern China against communist forces by Chiang. In the immediate aftermath of the war, as Soviet and Japanese forces departed northeastern China, he led troops in a series of speedy moves to occupy strategic towns and cities in northeastern China, clashing with Chinese communist forces frequently. In early 1946, years of war took a toll on his body, leading to the removal of his left kidney in Mar 1946. Returning to Shenyang, Liaoning Province on 16 Apr after only a month of recovery, he launched a new offensive on 28 Apr, leading to the capture of the city of Changchun in the following month. In Aug 1946, he ordered a renewed offensive, which saw initial victories, but key defeats in this new campaign halted the Nationalist momentum in the region, leading up to the siege of Siping in Liaobei Province, China. Although Du's troops were able to lift the siege before the end of Jun 1947, the pressures of war once again took a toll on his health. In Jul 1947, he was removed from his position due to health reasons and was withdrawn to Shanghai for medical treatment and rest. In Mar 1948, he was made a member of the National Assembly. In Jun 1948, he was made the deputy commanding officer of the Xuzhou Anti-Communist Command in Jiangsu Province, China, returning him to military command against communist forces in the coastal region. In Oct 1948, as communist troops surrounded Jinzhou, Liaoning Province, China, and he was rushed back to the Northeast Anti-Communist Command to salvage the situation. He arrived in Shenyang, Liaoning Province on 15 Oct, and Jinzhou fell on the following day. He recommended against an attempt to recapture Jinzhou, but Chiang rejected the perceived pessimism, instead ordering Du to go on the offensive, leading to a defeat that necessitated a major evacuation of forces in the area from Huludao (now Jinxi), Liaoning Province. On 10 Jan 1949, his headquarters unit was overrun and wiped out by communist troops in Shangqiu, Henan Province, China. His wife Cao Xiuqing and four children fled to Taiwan later in the year with the defeated Nationalist government. Captured, he remained imprisoned at the hands of the communists at Gondelin War Criminals Management Facility until 1959; it was said that the communist leadership pardoned Du in an attempt to have him persuade his Nobel Prize winner son-in-law Yang Zhenning to return to China. In 1961, he was named by Zhou Enlai as an official historian of the government, and progressively held more prestigious positions, leading to being named a member of the National People's Congress of 1978. In Jul 1963, he was reunited with his wife. In 1980, he made a propaganda announcement aimed at the Republic of China, now located on the island of Taiwan, urging the Nationalists to surrender to Beijing's authority. He passed away from kidney failure in Beijing, China in 1981. 29 Nov 1904 Du Yuming was born in Dujiawan in Mizhi County, Shaanxi Province, China. 10 Mar 1933 During the First Battle of Hebei, General Guan Linzheng of Chinese 25th Division was wounded in battle near Gubeikou Pass of the Great Wall, and Du Yuming stepped up to serve as the acting divisional commander. 12 Mar 1933 Du Yuming received orders to withdraw Chinese 25th Division from the area near Gubeikou Pass of the Great Wall in Hebei Province, China. 20 Feb 1945 Du Yuming was promoted to the rank of lieutenant general. 9 Aug 1945 Du Yuming arrived at Chongqing, China to meet with Chiang Kaishek, planning for a campaign against General Long Yun of Yunnan Province, China. 11 Aug 1945 Du Yuming arrived at Kunming, Yunnan Province, China. 29 Sep 1945 Du Yuming established a field headquarters north of Kunming, Yunnan Province, China for the upcoming campaign against General Long Yun. 30 Sep 1945 Du Yuming gave the order to launch a surprise attack against General Long Yun in Kunming, Yunnan Province, China, forcing Long to flee to the high ground at Wuhua Mountain, where he would soon surrender. 4 Oct 1945 Du Yuming and Long Yun arrived at Chongqing, China. 14 Oct 1945 Du Yuming received orders to travel to Chongqing, China to meet with Chiang Kaishek. 15 Oct 1945 Du Yuming arrived at Chongqing, China, where Chiang told him that Du was to become the scapegoat for the removal of General Long Yun; Chiang would later award him with higher positions for taking on this responsibility. 16 Oct 1945 Du Yuming was relieved as the commanding officer of Kunming, Yunnan Province, China. 18 Oct 1945 Du Yuming arrived in Chongqing, China. 26 Oct 1945 Du Yuming was named the commanding officer of the Northeastern Provinces Security Command. 5 Nov 1945 Du Yuming requested Chiang Kaishek for permission to use force to take Huludao or Yingkou, Liaoning Province, China from communist forces. He would receive the permission and would launch the offensive within days. 18 Feb 1946 Du Yuming was secretly flown to Beiping, China for treatment of his kidney ailments. 16 Mar 1946 Du Yuming underwent a surgery in Beiping, China, removing his left kidney. 16 Apr 1946 Du Yuming arrived at Shenyang, Liaoning Province, China. 8 Jul 1947 Du Yuming arrived in Shanghai, China. 15 Oct 1948 Du Yuming arrived in Shenyang, Liaoning Province, China. 8 Nov 1948 Du Yuming arrived in Beiping, China. 9 Nov 1948 Du Yuming arrived in Nanjing, China. 10 Nov 1948 Du Yuming was assigned to the Xuzhou Anti-Communist Command based in Jiangsu Province, China. 25 Dec 1948 Du Yuming was named a war criminal by communist leader Mao Zedong. 10 Jan 1949 Du Yuming was captured by communist forces at the Battle of Xubang (also known as the Huaihai Campaign) in Yongcheng, city of Shangqiu, Henan Province, China. 4 Dec 1959 Du Yuming was released from imprisonment. 7 May 1981 Du Yuming passed away from kidney failure in Beijing, China.